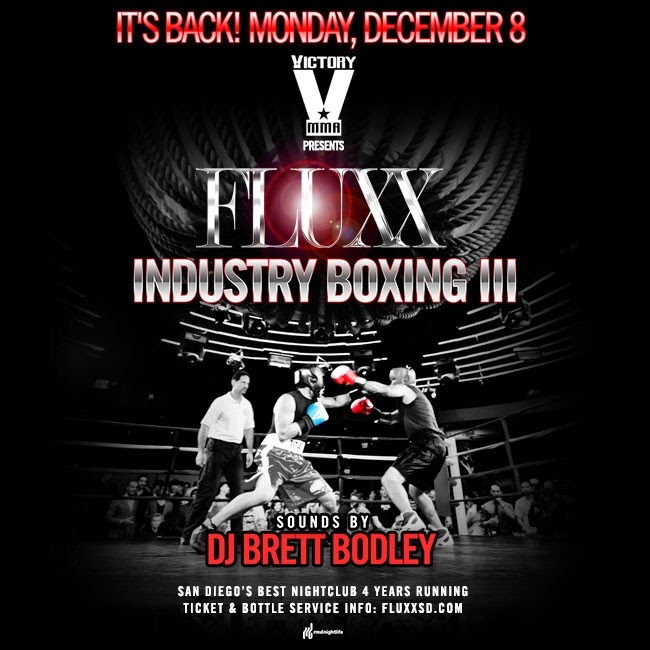 Industry Boxing is back at FLUXX for a third round on Monday, December 8. The downtown nightclub has once again teamed up with Victory MMA to bring you a night of “knockout" fights with their Industry Boxing III. This fundraising event is designed to raise awareness for local athletic charities that include Boys & Girls Club of San Dieguito, North County Youth Athletic Center and USA Boxing. The event invites all of the hospitality industry’s heavy hitters to come join FLUXX nightclub and show support. This charity event will bring together different people from the nightlife industry to go head to head in a boxing match in a professional standard boxing ring set on the FLUXX dance floor. In an effort to make a difference, one round at a time, the main event will take place on December 8 with doors opening at 8pm with the first bout beginning at 9pm. Tickets are $20 in advance for this 21 and over event. For more information and to purchase passes, visit fluxxsd.com/event/2014-12-08/industry-boxing-iii.